What Lizard-Like Animal Did Darwin Study? Charles Darwin was a famed English scientist of the 19th century, and his studies into the natural world were diverse and numerous. On the Pacific Ocean's Galapagos Islands, he studied both Galapagos land iguanas (Conolophus subcristatus) and marine iguanas (Amblyrhynchus cristatus). These reptiles aren't just lizard-like, they are lizards in their own right. From a purely aesthetic standpoint, Darwin didn't think too highly of Galapagos land iguanas, whom he mentioned as existing in massive numbers all throughout their homeland. He detailed their physical appearance as not only being unsightly, but also having a rather unintelligent look to it. He also mentioned the awkward and ungainly manner of marine iguanas. These sturdy iguanas spend the a lot of their time tucked away in cozy burrows. In the day, they frequently seek refuge under stones, plants and trees -- a means of avoiding the aggressive sun. 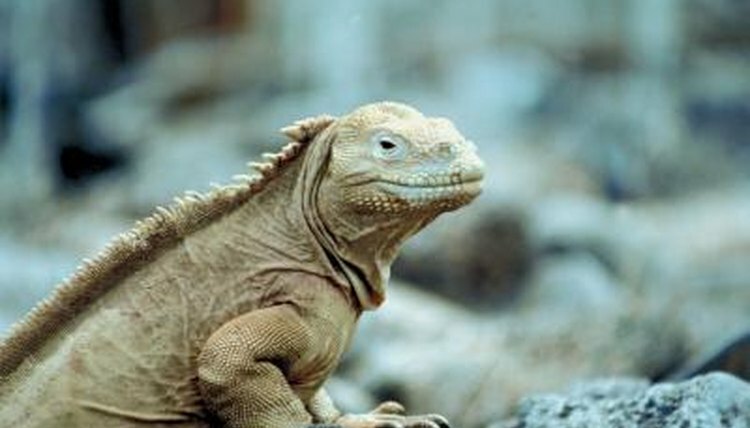 In terms of coloration, Galapagos land iguanas are brownish or yellow. These sizable lizards are mostly herbivorous, consuming a lot of prickly pear cactus, both the plant's foliage and fruit. Succulents are beneficial for Galapagos land iguanas as they provide them with hydration -- a must-have in their arid living environments. Marine iguanas are drastically different in coloration than Galapagos land iguanas, with black or deep gray physiques. Galapagos land iguanas also have markedly longer snouts than the marine varieties. Marine iguanas also are herbivores, eating mostly marine algae. They extract algae from stones using their tiny, uber-sharp chompers. Although they have tough exteriors, they're rather innocuous animals. Darwin commented on the lazy, unwieldy motions of marine iguanas on terra firma, but at the same time was highly impressed by their adept swimming abilities. Marine iguanas often occupy themselves by lounging in rugged shore locales. They also are common sights on beaches, however. Although Darwin undoubtedly focused heavily on iguanas during his time on the Galapagos Islands, his commentary wasn't in any way limited to the big and bulky lizards. He paid great attention to birds -- specifically Darwin's finches, which were named after him. He also concentrated a lot on Galapagos giant tortoises (Geochelone nigra).